Jaded Blossom: You've Been Boo'd! 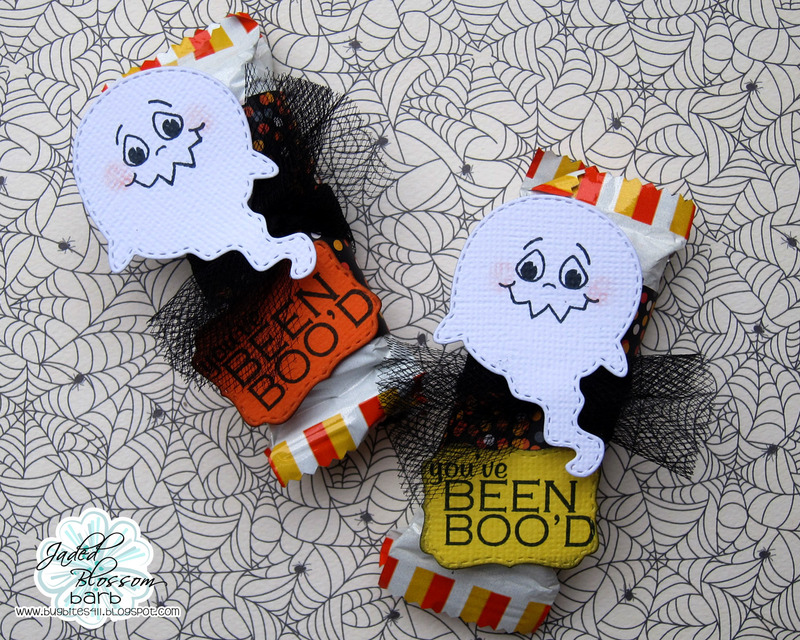 You've been boo'd on this September Monday!! Barb from BugBites here to share a project I did using this months featured stamp set, Halloween Treats. These little treats are perfect for the classroom of co-workers and easy to do when you have many to make. I used two Hershey snack size candy corn chocolate bars stack on top of each other. I wrapped a 2" band of pattern paper round each. On top of that I added some black tulle. You could use any ribbon or twine as well. The ghost and tag were cute from the Jaded Blossom Halloween Dies. I simple stamped a PKS face on the ghost. Any face will work. If you don't have any face stamps, just draw a face. After all, its a ghost,...a couple dots for eyes is all you need. 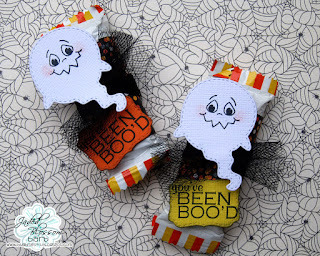 The tag was stamped with my sentiment from the Jaded Blossom Halloween Treats stamp set. So cute I had to tell you again! !